During a recent consulting work with a client I had a requirement to sum up values that meet some criteria across columns and I wasn’t sure if the SUMIF would hold. Boy, I was wrong. It worked nicely and I still stand by my statement “If I get a dollar for every COUNTIF / SUMIF I write, I will have million dollar bills.“. Did you try 2D SUMIF? Share your tips and ideas thru comments. Bonus: This should work for COUNTIF, SUMIFS, COUNTIFS etc too. But you already knew it. Anyone know an easy way to do multiple conditions SUMIF/COUNTIF Thanks! @ Eric: in Excel 2007 you have SUMIFS and COUNTIFS which accept multiple conditions. Otherwise you should try and find out more about SUMPRODUCT. Eric: Check out http://www.excelhero.com/blog/2010/01/i-heart-if.html where you learn how to do this kind of stuff using either sumproduct or array formulas. If you have excel 2007, close your eyes and use SUMIFS. Otherwise use either SUMPRODUCT or SUM formula (array entered). Both these techniques take a while to sink in, but work well. also, see if you can enable "Conditional SUM Wizard" from Excel Addin menus. If so, you can use that to write these array formulas for you. There is absolutely no reason to use the + sign, unless you want to broadcast that you're still longing for Lotus123. The multiplication with 1 will coerce the TRUE/FALSE values of the first array into 1/0 values, but you can achieve that by using the * operator instead of the comma. Wow! Another stellar find Chandoo, thank you for sharing this one. What if the criteria range is two dimensions but the sum range is one dimension? I tried that and I could not get it to work. 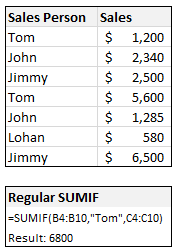 For example: =SUMIF($A$2:$C$3,$A6,$A$1:$C$1). In this case it seem to only look at the criteria values in $A2:$C$2 and ignored $A$3:$C$3. 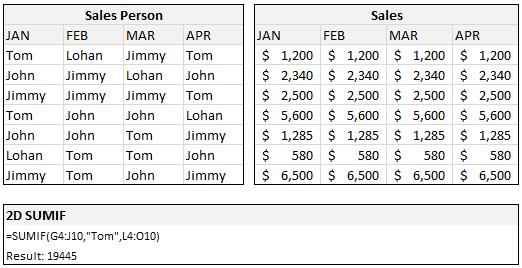 For the criteria values in the second row of the criteria range the formula returned a zero.